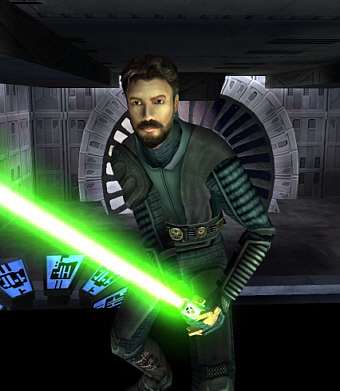 Every Skinner I've talked to has their own version of the Kyle Katarn skin for the single player game. This skinner is no exception. Here's a skin I created to replace the in-game Kyle skin. 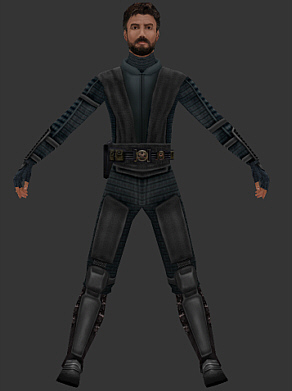 The design isn't mine, but is based off of one of the many of the unused Jedi costume concepts left over from Episode I. While I don't feel that it captures the essence of the Jedi, the costume still looks cool. Other than creating the overall costume I've also edited the Kyle head. He now looks younger and a bit more serious than the original. Threre's still some work in detailing that needs to be taken care of but the upper torso is getting very near to being complete. The legs still need a lot of work though. In fact, he's still wearing Kyle's orignial boots. I've done some work on the lower half of the body, but I'm still not satisfied with the way the boots look from the sides or back yet. I just forgot to turn it off before I took the picture.